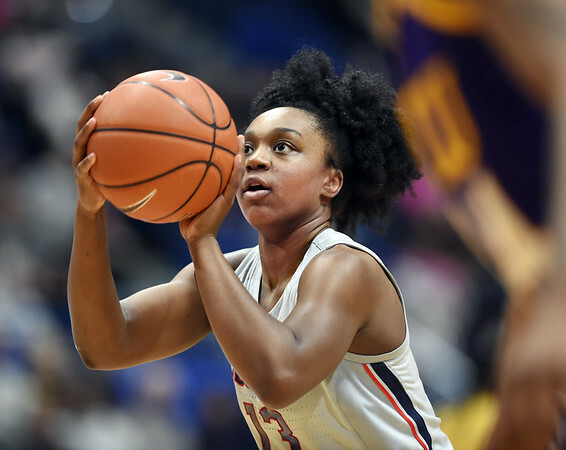 HARTFORD - While her fellow starters had already found comfortable spots on the bench, Christyn Williams got a few extra minutes on the floor during the UConn women’s basketball team’s 118-55 rout of East Carolina at the XL Center Wednesday night. The fifth-ranked Huskies hope what they saw will continue for awhile. A finish inside off a pass from Molly Bent was followed by a 3-pointer from the wing as the freshman guard capped off a 15-point, season high six-assist performance in style before she took her seat and received a few words of encouragement from associate head coach Chris Dailey. Williams scored in double figures for only the second time in eight games and she shot over 50 percent from the floor (6-for-10) for the first time in that eight-game stretch. Her assist total topped her previous best of four and matched the number she had in the previous six games. She also didn’t commit a turnover and made three steals. It was a productive 30:21. Even when she scored just two first-half points as the Huskies (20-2 overall, 9-0 American Athletic Conference) took a 45-point lead she was getting things done. She had three of her assists and two steals while helping to limit the effectiveness of ECU leading scorer LaShonda Monk. There was no letdown in the second half, whether she was with the starters or with the reserves. Three years ago when Samuelson was a freshman and the No. 1 recruit coming out of high school, she turned to then-senior Breanna Stewart for help and advice. Williams has s similar option with Samuelson. But the Little Rock, Arkansas, native is also quick to turn to those who have known her for her whole life. “This is my first time coming across adversity basically, so I just surround myself with positive people,” Williams said. “Negative thoughts can take a toll on you in many different ways whether it is physically or your mental state and being. I’ve talked to the coaching staff, my teammates, my family and I know that optimism is key. With the first game of their three-game homestand a success, the Huskies will look for another strong effort Saturday against AAC foe Temple at Gampel Pavilion leading up to their showdown here Monday with No. 12 South Carolina. Posted in Newington Town Crier, UConn on Friday, 8 February 2019 21:30. Updated: Friday, 8 February 2019 21:33.